Fireman William Young Barker was killed when the steam ship he was aboard struck a mine on 20 September 1941, he was aged 31. William was born in Todmorden in West Yorkshire on 19 September 1910. His father David Henry was a foreman at one of the many cotton mills while his mother Lily cared for William and his elder brother John Greenwood Barker. William married Gracie Parker at Todmorden on 13 October 1934. Their daughter Molly followed soon after. By the time of the 1939 Register he and Gracie are listed living at 9 Crescent Road, Sandown and he's earning a living as a master dairyman, either employed by or in partnership with his parents who have also relocated from Yorkshire to The Dairy, 91 High Street, Sandown. The Register, taken on 29 September, evidences that by now William is also serving with the local detachment of the Auxiliary Fire Service and he appears in the list of Sandown's AFS personnel detailed in the diary of Chief Officer Wilfred Brown on 1 January 1940. By February Brown had Barker posted to the Grove Road Patrol Unit. William was said to have possessed a fine singing voice and often joined the choir at the Congregational Church. Shortly after the National Fire Service was formed in August 1941, William transferred to the Portsmouth district and it was here he had been in service on 19 September when he was delayed returning for some much needed home leave. Accordingly he waited in Portsmouth for the 03:00 Southern Rail mailboat crossing in the SS Portsdown. The vessel was surprisingly full for the time of morning, mainly with troops either returning home on leave or those given new postings. Among them, and kept protectively from them in the saloon by the ships crew, was one Anne Ainsworth, a trainee wireless operator of the Women's Auxiliary Air Force, who was also looking forward to some time at home having travelled through the night from Waterloo. Anne remembers the events with clarity; I settled down to get some sleep and when the time came for the steamer to leave I felt the throbbing of the engines as we pulled away from the dock. William was at the other end of the same vessel and as Anne recounts; The ship had just left harbour when suddenly there was a terrific explosion, a blinding flash and the sound of crashing timber and metal. I was struck on the shoulder and the side of my face by falling debris, then thrown to the floor. There were shouts, screams and the creaking and groaning of the ship. The noises all mixed together in the pitch black created a ghastly waking nightmare. Someone found me in the dark and helped me to my feet. Voices came out of the dark asking if anyone was hurt but, apart from being badly shaken, we appeared to be in one piece. 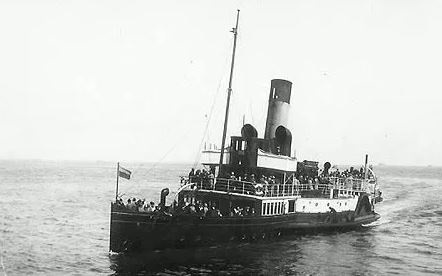 Ann was rescued along with many others at her end of the ship and was returned to Portsmouth and comforted with a blanket and hot tea before finally restarting her crossing on the Portsdown's sister ship SS Merstone. Unknown to her the Portsdown had split in two. One end had come to rest on a sandbank and sat safely above the tide while the other plummeted into the cold dark sea. William and several others, both Islanders and posted troops, went down with the wreckage. 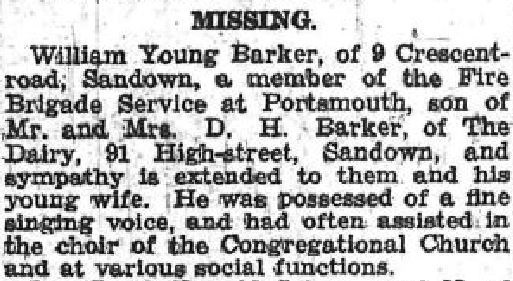 The following edition of the County Press merely listed him as missing. A short while after William's body must have been recovered and the funeral arranged for 7 October, as noted in Chief Officer Brown's diary. The fact that the United Kingdom register of WW2 Civilian Deaths lists his place of death as Seaview foreshore suggests his body drifted the entire width of the Solent before being recovered close to the Island. The first part of the service was held at the Congregational Church officiated by the Rev. E. Nicholas. The interment was at Lake Cemetery attended by William's widow and parents, several other family members and friends and a mass of firemen with Chief Officer Brown and Second Officer Holbrook. Rest in peace Fireman Barker.